The first Match M for Kids update is ready!! If you are following us in our social networks, you'll notice that we are working on new games. But we do not forget our Match M for Kids ( we hope, nor do you...). We are pleased to present the first update. We have tried to consider all demands and requests for a game that suits your desires. Now Match M for Kids, include scores!! So it can be challenging yourself and knowing your time you can enhance your records. 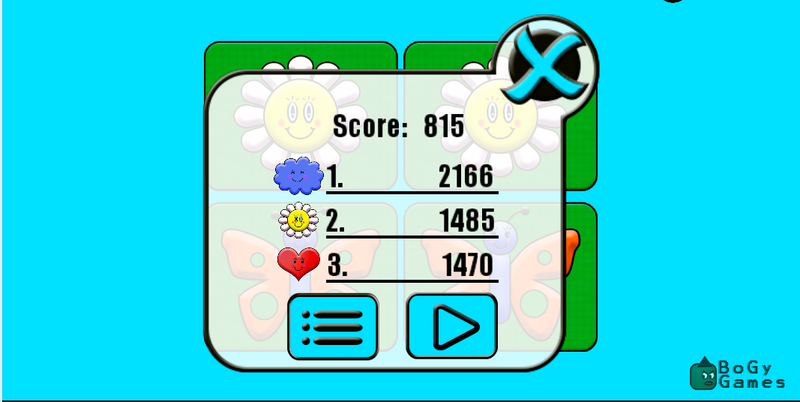 You can see how your scores increases and your visual memory improves with Match M for Kids. You will be able to compare scores with others and demonstrate your visual speed. Also, you can store your preferences. So if you want to play without sounds or without music, your preferences will be remembered. Try our first update, and tell us... what do you think? We'll appreciate all your comments and suggestions. So help us to improve our games by sharing your opinion. Bogy Games creates games for everybody ... games for you! !